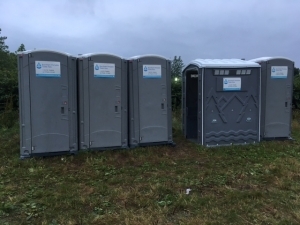 We recently supplied our Event Toilet range for this amazing festival. This is our 3rd Year in a row and we are always excited to supply for this event. 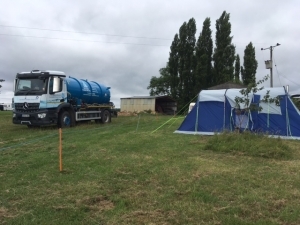 Mark and his family spent the weekend camping at the beautiful Garslade Farm, mixing business with pleasure. Mark and Emma doubled up to make a superb husband and wife team, maintaining and service our units to ensure all guests of Garslade Farm were kept happy. 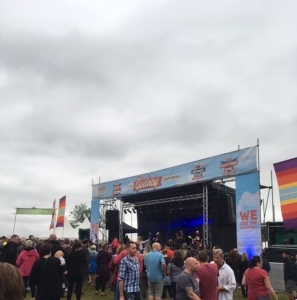 Godney Gathering takes place next to Garslade Farm and Camping, Godney near Glastonbury in Somerset, with seven stages including a silent disco, comedy and cabaret. The Darkness; Nathan Grisdale; Dub Pistols; Ferocious Dog; Whitehall Parade; The Leylines; The Mini Band; Shoot The Moon; The Bar-Steward Sons of Val Doonican; Funke and the Two Tone Baby; and many more. The weather was a little wet to say the least, but this did not dampen the festival goer’s mood, and a great time was had by all. The Food and Cider was flowing and everyone partied until the early hours. In the midst of all the bands we heard a familiar tune. The popular tune from Abba Waterloo, has been changed to “Porterloo” The band singing this belter of a tune was “The Bar-Steward Sons of Val Doonican”, they were fantastic and we of course purchased a CD. Godney we will see you next year!! !